BeingManagement is Japan's #1 Critical Chain Project Management (CCPM) software. 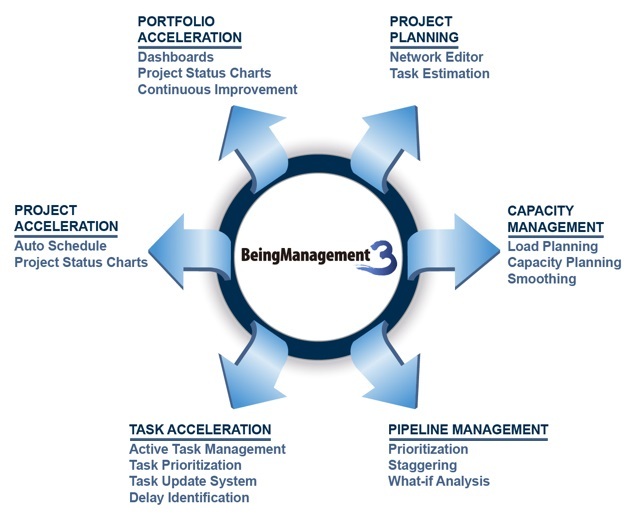 Every feature of BeingManagement is expertly designed for achieving high due-date performance and improving reliability without cost overruns and resource overloads. In the more than 15 years since its introduction, BeingManagement has been adopted by over 800 clients in many industries around the world, and has become the #1 CCPM software for major Japanese companies, including Mazda Motor Corporation, Sharp Corporation, OMRON group companies and Toshiba group companies. Many CCPM implementations have been successful, BUT some have flourished for a while and then have faded. What are the keys of continued success with CCPM? If you think your organization lacks the insights of CCPM or a correct road map of CCPM implementation, you can get both of them from the CCPM training program. All of the organizations highlighted in the case studies below recognized the impact that moving from single-project software technology to a project portfolio solution would have on the speed and due date reliability of their project-based businesses. Click below to explore selected case studies of BeingManagement implementations.